A Soft Place to Land, Waitress the musical by Sara Bareilles. (I highly recommend listening to the entire musical, it’s beautiful and it’s finally coming to UK February 2019. I cannot wait!). Laura Marling had this charming chap on tour with her earlier this year, so no surprise she’s featuring on his current single, Take This Body. I LOVE IT. This time in two weeks. Cannot wait. I’ll be frank with you, this is not my copy of Pretty Honest. It’s my twin sister’s. I have my own copy and I seriously have been reading it, but in order for you to understand why I chose a beauty book over a diet or mindfulness book for the 31 days of inspiration challenge you need to understand where I stand with make-up. About ten steps behind my twin sister. My sister’s always been into her make-up, which if I’m honest has made me pretty lazy when it comes to making decisions about my own. Despite being only 40 minutes older than me, she’s got years on me in terms of cleansing, foundation, eye lash curlers (horrible, horrible contraption that I will never let her use on me again) and general beautification. Where I have a cute little china mug full of my make-up products, she has a cabinet. 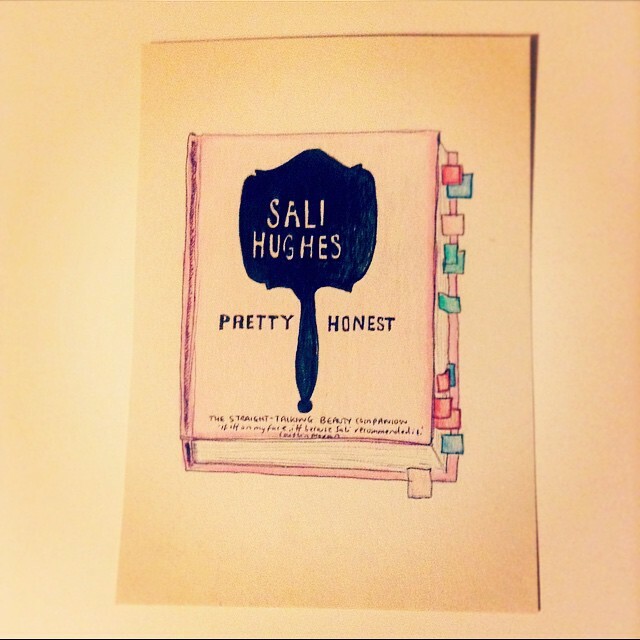 Her methodical approach to Sali Hughes’ Pretty Honest came as no surprise this Christmas. And I’m trying really hard not to revert to type and just ask my sister to buy me the products she thinks I should be using, because as Sali says, we all have different skin types, and we should know our own skin better than anyone else. Step one. Get to know my skin. Step two. Look after it. Easier said than done, however, Sali’s daily routine page spread has been genuinely helpful, and her revelation that toner is unnecessary made my week. I now have to somehow get to grips with SERUMS though… When did serums happen?! (I’ve set myself a ‘Say Yes‘ challenge, I’ll be attempting to take charge of my beauty routine this January through the wisdom of Sali Hughes. I’ll illustrate my findings on postcards to share with you here and then send out into the world). 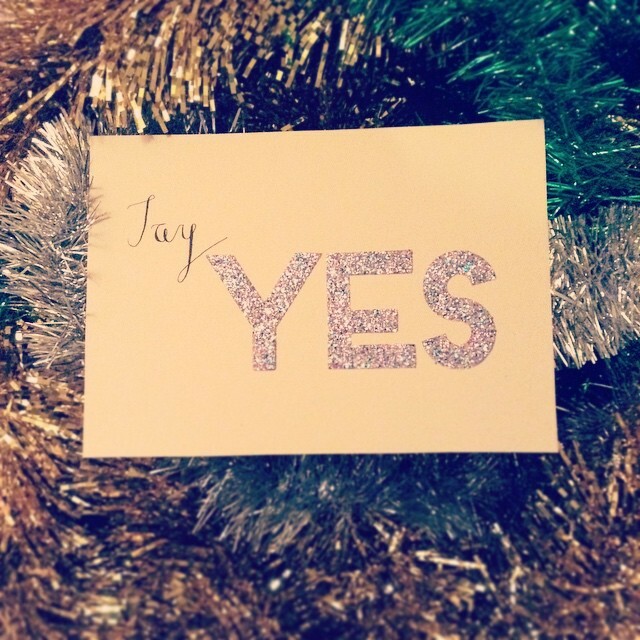 One of my close friends recently simplified and improved one of my rambles of a new years’ resolution as the classic ‘Say Yes’. So I’m going for it, and I’m combining it with my other two resolutions; 1. to take more time for art projects, and 2. to write more letters to people I actually know and care for (instead of just snail mail projects! ), most specifically my mum who always sends lovely postcards and totally deserves to receive more. Each month I’ll be ‘saying yes’, so embracing a new skill, going somewhere new, just, you know, trying something different to my normal routine. I’ll illustrate it on a postcard and then I’ll send that postcard out into the world. BOOM. Three New Years Resolutions in one project. Winner. January’s ‘Say Yes’ will be combining a project for work (multi-tasking to the max), 31 Days of Inspiration, where I’ve been tasked with reading Sali Hughes’ Pretty Honest and putting her advice into action! For those of you who follow me for music suggestions, I’ll still be doing those. Say Yes happens to be my favourite song on Langhorn Slim’s Be Set Free Album (a foot stompingly amazing album folks) so rather apt for today.